What is CBD Hemp Oil? Cannabis Animus Answers Hottest New "Search"
As an update to an earlier post on the subject of CBD Hemp Oil from last year, I’d like to expand further on the following subjects while attempting to answer any questions you may still have about what CBD oil is and what it’s used for. CBD Oil, aka Hemp Oil or Cannabidiol, is a daily dietary supplement, natural medication and extract from Cannabis plant varieties. It is the second most abundant of over 85 cannabinoids found in the Cannabis plant, and one species, in particular, is by far the largest source of cannabidiol (CBD) and is commercially harvested around the world. The common “hemp” species called Cannabis ruderalis differs from its siblings, Cannabis sativa and Cannabis indica, in one very obvious way. These latter two species are commonly known as “marijuana” for the flower tops that are dried and smoked for its increasingly popular high and euphoric effects. In comparison to CBD, hemp contains very little THC (tetrahydrocannabinol) which is the most prevalent cannabinoid and also the most psychoactive component in marijuana. Hemp, however, has a distinct advantage over marijuana in at least one very special way. Hemp (Cannabis ruderalis) is higher in the non-psychoactive cannabinoid CBD (will not get you high) and has been identified as having many medical benefits including being 100% safe and 100% non-addictive as medication. More detailed medicinal and nutritional applications are listed below. In a general sense, hemp is arguably one of the most valuable and sustainable crops in existence. Commercial hemp is and has been cultivated all over the world for its myriad uses for tens of thousands of years. It has been proven to turn toxic soils into fertile, and ‘clean’ soil after only a few harvests. With the exception of the 2014 Farm Bill, the United States of America has outlawed its cultivation in order to protect competitive and political interests in Agra-business and crude oil production. Perhaps thousands of industrial and personal uses have been developed throughout millennia, but only in the last century has it posed a threat to the Petroleum companies, Big Pharma, and the Medical-Industrial Complex. The obsequious 2014 Farm Bill has allowed only a handful of growers in a few States to grow hemp for “research use purposes only”. Virtually all hemp oil is consequently extracted as a by-product of commercially harvested hemp in other countries and then imported by producers of hemp and CBD oil products in the United States and elsewhere. (*Hemp Seed Oil does not contain cannabidiol). Cannabis is the only plant that I am aware of that contains all essential fatty acids, and therefore is arguably one of the most nutritious food additive and ingredient. Cannabidiol is increasingly found to improve more than just the “homeostasis” of ourEndocannabinoid System. Research and medical studies are showing that this “balance” that is characteristic of optimal physical health and psychological well-being is facilitated by the uptake of CBD to the cellular level. So let’s take it from top to bottom… so to speak. Antipsychotic, Antidepressant, Anti-anxiety, Antioxidant, Neuroprotective, Slows/Prevents Alzheimer’s, Treats ADD & ADHD, Help’s with Tourette’s Syndrome and OCD, Pain Relief including PMS, Migraines, Fibromyalgia and more. Vasorelaxant for the treatment of Glaucoma that reduces inner-optic pressure. This increase in pressure causes the optic nerve bundle in the back of the eye to “cup” or otherwise malformed – eventually causing blindness. Anti-inflammatory, prevents plaque buildup on arterial walls, increases blood flow facilitating Atherosclerosis Therapy. Slows and even proven to kill Colon Cancer cells, treatment for Crohn’s Disease, and Anti-prokinetic (digestive aid). Treatment for pre-cancerous cell development (actinic keratosis) from sun-damaged skin, and minimizes acne breakouts. The way CBD works is fascinating in the truest sense of the word, and a description of it gets pretty challenging in the sense that there are tons of terms and processes that CBD affects within the body. So, in an effort to summarize for the purpose of this post, I will keep the technical stuff to a minimum. For a more detailed yet general understanding please check out my post covering “Cannabis and The Endocannabinoid System”. Many of the benefits of cannabis, and more specifically cannabidiol, as a healing medicine are found in neuromodulatory lipids and specific receptors in our brain that are intimately involved in a number of mental processes including pain management, mood, hunger, sleep, and memory. Scientists have discovered that we have an endogenous cannabinoid system within our bodies called the endocannabinoid system. It is believed that this is Nature’s design for our bodies to regulate homeostasis – or simply stated as regulating the proper balance between the interdependent elements and systems operating within our bodies. CB1 receptors are mostly found in our brain and spinal cord (central nervous system) and less in the lungs, liver, and kidneys. CB2 receptors are found in the immune system and hematopoietic stem cells (HSCs) which are the origins of all other blood cells. Cannabidiol also functions through receptor-independent channels such as with regard to a rather commonly known neurotransmitter called Serotonin which plays a large role in mood balance. TRPV1 (transient receptor potential cation channel subfamily V) is one of a number of variants that reconciles the effects of natural herbs and plant-based nutrients. GPR55 is a G-protein receptor that has been identified as promoting cancer cell growth, and CBD acts as an antagonist that blocks GPR55 signals. PPAR receptors regulate genes that are involved in metabolic function and insulin regulation. Re-uptake inhibitors are believed to play an important role because many of the benefits of CBD are realized due to their core functions. It is this re-uptake inhibition that allows CBD to demonstrate its neuroprotectant characteristics. It has even been shown that CBD changes the shape of GABA-A receptors which has a calming effect on our bodies. So, what is pure CBD hemp oil? As you would expect in this rapidly expanding industry, there is ‘essentially’ no adherence standards or legitimized nomenclature. However, there are some distinctions I’ve found through my research, testing and recommendations. One of the finest I found and use personally is “CBD Pure” hemp Oil. It is what is traditionally known as organic CBD Hemp oil or Hemp Oil. It is available a 300 mg CBD potency and 600 mg (recommended). This can bring what is referred as “full-spectrum” benefits when the oil includes the hemp plant’s natural phytonutrients, flavonoids, and terpenes. CBD Oil on the other hand is a term often reserved for products like “CBD Living Gel Caps” where the CBD is nano-sized (reduced to one millionth normal size) in order to greatly increase uptake to the cellular level providing 100% bioavailability. These products are typically manufactured using CBD crystalline isolate as its source of CBD as opposed to the hemp oil varieties. Or any other solvent used in production – just 100% cannabidiol. CBD Living Isolate is an example of 99,5% pure CBD, but not in oil form. It’s in a crystalline form that can be mixed with oils, used in food preparation, or vaporized and inhaled but his intended for making edibles and oils. However, CBD oils that are not labeled “pure” do not necessarily reflect on lower quality. On the contrary, “full spectrum” CBD Hemp Oil informs the patient or customer that they can expect to taste and aroma. The terpenes and flavonoids that are purposefully and carefully preserved to enhance the desirability and value of the product. Look for the amount of CBD in each dose. It may very well be premium priced and rightly so. CBD oil vapingis becoming increasingly popular due largely to the direction most have taken away from smoking combustibles like marijuana in favor of inhaling only the vapor from the heated oil of non-psychoactive cannabidiol itself. Battery technology advances are delivering better and better electronic vaporizers in various forms and sizes ranging from the convenient to carry CBD oil vape pens to expensive vaporizers and elaborate “dab rigs” for more organic social rituals. Not much needs to be said on this subject. Anything you can imagine has already been thought of… the only question is one of personal taste and preference. Some chefs prefer to incorporate natural terpenes and flavonoids into their recipes, but it is the "99.5% pure CBD “isolate” that is used mostly for edibles because it has virtually no flavor when blended into the ingredients properly. As a person who enjoys smoking flower as well as vaping CBD oil, CBD concentrates are one of my preferred types of CBD oil products. My preferred brand CBD Living Shatter is 90% pure CBD with 10% full spectrum terpenes added back in for its highly desirable, signature flavor. Interestingly enough, most high-quality CBD hemp oils will be reduced or concentrated into a pure crystalline isolate form as stated above. It is then that the natural cannabis terpenes and sometimes even natural flavoring is added back to the isolate in order to create the final vape oil or concentrate’s characteristic flavor. This allows for a more pure and consistent product. Natural, easy to swallow gelatin capsules contain the CBD and is swallowed. Although the digestive process takes the lion’s share of the nutrients we ingest. CBD Living Gel Caps use nano and micelle technology to amplify the effectiveness of CBD by nano-sizing the cannabidiol prior to inserting into the gel capsule. It’s this technology that makes CBD Living products so much more effective than other CBD products, and that’s why I have personally tested them all and can attest to this fact. 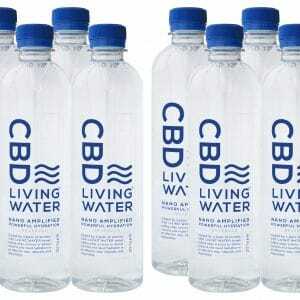 Please see my post called “What is CBD Living Water?” for a complete list and description of all their products. Considering the fact that the bioavailability of a nutrient suppository is approximately double that of the same nutrient taken orally. However, this does not hold true for CBD Living products which uses nano and micelle and colloidal droplet delivery technology to amplify the potency of their products approximately 10x – even when taken orally. Every study I’ve ever read or read about has concluded that CBD is 100% safe, non-addictive, and free of side effects. It has been determined that cannabidiol is non-toxic to humans and animals. CBD does not adversely affect heart rate, blood pressure, body temperature or any other vital functions of the body. It has also been determined that most CBD administered is gone from the body in 8 – 12 hours which explains why most people need to dose at least every 6 to 8 hours for the treatment of specific conditions and diseases. Healthy people only need once per day dosing as a dietary and health supplement. Proven by Dr. Raphael Mechoulam, Professor of Medicinal Chemistry at The Hebrew University of Jerusalem, Israel, the cannabinoids in Cannabis such as cannabidiol are the same compounds that regulate many functions of the mind and body including mood, pain, blood chemistry, immune system, and bone formulation. Recent discoveries in neuro-hormones point toward cannabinoids like CBD as a way out from the darkness and discomfort of anxiety and depression – naturally, without side effects, and permanently. CBD hemp oil has been shown to empower the body with the ability to heal and repair itself with a powerful boost harnessed within the ignorantly maligned Cannabis plant. Research demonstrates a clear relationship between altered endocannabinoid signaling with cancer, cardiovascular disorders, psychiatric and neurological disorders. And more recently, CBD Hemp oil and related CBD products are being praised by top level athletes who are reporting measurably higher levels of performance and quicker recovery times. I’m 58 years old and I’ve tried every mainstream, natural, health supplement, pain reliever, and even a bunch that I’ll bet none of you have ever heard of… and none of them have ever been able to literally change the way I feel in under 1 minute as does CBD. It’s just that simple. And no other pain reliever can claim all three: 100% Natural, 100% Safe, and 100% Non-Addictive. Well, I hope you have found this post to be helpful and a useful addition to my post last year about what is CBD hemp oil used for. Please don’t go without leaving a comment below! Great article, thanks. I’d like to mention that the quality & potency of the CBD hemp oil is crucial to health results. You want a high potency product with 1500mg/oz or higher and NO isolate, but a full spectrum product. Yes, that means .3% THC, but they all work together to achieve better results. I find your site very interesting indeed, and will definitely look further into Zion Medical’s research and work at http://zionmedical.com/. I encourage our members to check them out as well for their groundbreaking research in HIV/AIDS and cancer cures. Very nice of you to stop by and share with our members Brian. Ted, I think we got website’s mixed up. We are Zion Medicinals, NOT Zion Medical. I can definitely how easily that could be mistaken. Keep up the great content and good luck with the site. Thanks for pointing out my error. And thank you for pointing out your upcoming site at https://zionmedicinals.com/ . I’m going to be researching the spagyric extraction process and the “Spagyrex Process”. What great info Brian! Good luck my friend and keep in touch! Perhaps I can help you market your product here at CA in the future if everything works out for you and your team. Godspeed. I have joined your rss feed and look forward to your membership communications… Excellent post. Additionally, I’ve shared your website in my social networks. Excellent! Welcome aboard Van. I am upgrading the Cannabis Animus Membership platform as we speak, and I’m really looking forward to your comments on that soon. Hello my name is Karol Thomas. My husband was suffering from liver cancer, and the doctors told me that there was nothing that they could do to save my husband’s life. Then a friend told me about hemp oil. I told her that my husband’s liver cancer was in the last stage and that I don’t think the hemp oil will be able to help. But she persuaded me to try. I did some research and I found a doctor who helped me with the cannabis oil. He assured me that after 3 months the liver cancer will likely be gone. For the past year my husband is perfectly okay and he is free from cancer. I think the admin of this web site, is actually working hard in favor of this web site because all this information here is quality based material. I just want to wish this membership well, and I joined too. Thank you. Thanks for the kind words Alex, look forward to my new video on the About Ted and About Cannabis Animus pages and you can get to know me a little better too. And look forward to our weekly membership updates! Wow, thank you so much for sharing your story and I really can appreciate your wife’s joy. I’m sure there’s nothing like the day when you find out you have it, and there’s nothing better than hearing that you’ve beaten it without harmful drugs and poisonous therapies that leave your immune system lower than when you started. I think it’s also important to remind people that RSO and Cannabis oil is not only for cancer patients. Yearly cleansing using Cannabis is highly advised to keep the cancer away. Keep sharing your story Sancho! It’s so important that you tell as many people as you can. You are helping to save lives! I want to specially thank Rick Simpson for saving my wife’s life with his healing oil here in the United State of America. My wife was diagnose with Breast Cancer 5 years ago, and ever since she have done a lot of Chemo and Radiation that have not helped her, but only damaged her immune system and render it weak and helpless until I saw a post on Facebook on how the cannabis oil had cured cancer patients, and now with your help my wife is heal i am happy thanks Rick Simpson and Cannabis Animus! Thank you Emi for sharing with our members! I get so many questions about RSO (Rick Simpson Oil) that I wrote a pretty recent blog post article called, “What is Rick Simpson Oil?. You might want to check it out, and leave a comment there too. Manny spouses and relatives, caregivers, could benefit from you and your husband’s experiences. I’m so thankful too that your husband is better now and all because of this miraculous plant. Thanks again, for your comments! Please consider joining Cannabis Animus, it’s free to join, and you can get discounts on CBD products that will help keep her nervous system and immune system healthy.